Mumbai: Sugar prices in the commodity exchange market ruled firm in the backdrop of sops announced by the government providing financial assistance to sugar mills to improve their liquidity status. “Sugar prices have shot up by Rs15 to Rs1,400 per quintal in Mumbai and by Rs10 to Rs1,475 a quintal in New Delhi, on reports that sugar mills have stopped all discount sales and would now be able to pay farmers the money they get from interest-free loans," said Amar Patil, a dealer based in Mumbai. Sugar futures on the National Commodity & Derivatives Exchange Ltd are also likely to remain steady followed by spot sugar prices. The active January contract, sugar futures went up by 1.32% to settle at Rs1,305 levels on Tuesday. Faced with an abundant sugar output this year, the Union government has decided to provide soft loan packages to the sugar industry to clear cane price arrears for the current and previous marketing seasons. Meanwhile, traders are expecting the annual production of sugar to remain lower than the last year, a top industry analyst said. As per data released by the Indian Sugar Mills Association, sugar production in India grew by 47% to 28.33 million tonnes (mt) during October-September in fiscal 2007. The industry was expecting sugar production to rise further and scale yet another high of 29.9mt in the October-September period in 2008. “Sugar futures prices are trading with range bound positive sentiments," Prasoon Mathur, analyst with Religare Commodities Ltd, said in a research note. “Due to delay in crushing for almost one month, traders are expecting the annual production of sugar to remain lower than the last year." The delay in the crushing process in Uttar Pradesh could provide necessary support to the prices, said Amol Tilak, analyst with Kotak Commodity Services Ltd. “There is a shortfall in good quality sugar in the north," he said. “Thus a Rs10-15 rally in (per quintal of) sugar cannot be ruled out." In addition, in the summer, the recovery percentage will reduce. The export prospects for raw sugar are comparatively better. Mandatory blending of ethanol may also provide some support to sugar prices. Thus, overall prices may stay range bound and positive in the next several days. 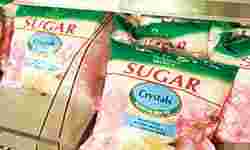 The new sugar will be sold at premium prices because of good quality, Mathur added. The government’s recent approval for the manufacture of ethanol directly from sugar cane may result in the diversion of sugar cane, thereby reducing production of sweeteners. It is expected the production would be around 28.5mt, against earlier estimates of 30mt, analysts with Karvy Commodities Broking said.